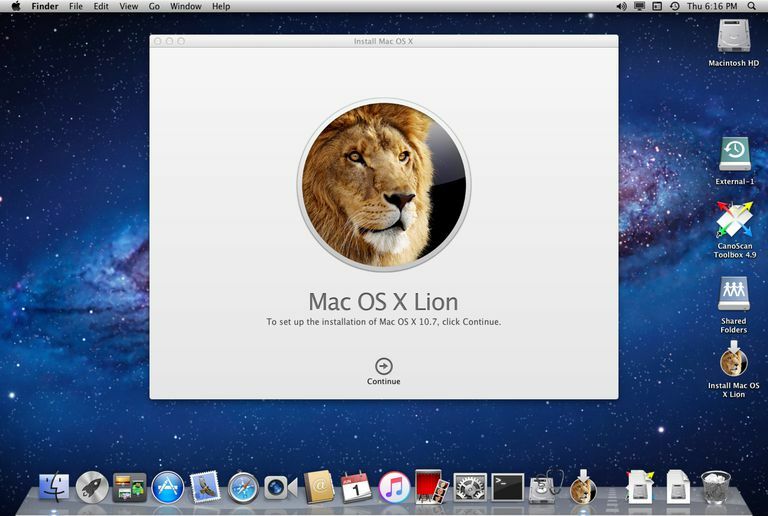 Before you start the OS X Lion installer, there are a few steps you should take first. Screen shot courtesy of Coyote Moon, Inc.
Planning an installation of OS X Lion involves picking an installation type to use, as well as preparing your Mac for the installation by performing backups and creating bootable Lion installers. OS X Lion offers all of the usual installation options, including upgrade and clean install. The difference between Lion and earlier versions of OS X is in how the installs are performed and what you end up with on your Mac when everything is finished. One new feature built into any method you use to install OS X Lion is the automatic creation of a recovery partition on the drive. The recovery partition is a small bootable volume that contains emergency utilities, such as Disk Utility, and includes the ability to restore from Time Machine and access the Internet. Also on the recovery partition is a copy of the Lion installer, which lets you re-install OS X Lion should the need arise. The Lion recovery volume is a nice addition to the OS, and the ability to boot into this volume and perform maintenance with Disk Utility is a welcome convenience. The recovery partition doesn't include a copy of OS X Lion, however. Instead, it connects to the Apple web site and downloads the current version of Lion. So, if you want to re-install OS X Lion using the recovery volume, you're going to need a reasonably fast Internet connection. I mention the recovery volume that Lion creates because it may affect your installation plans. The recovery volume is small, less than 700 MB in size, because it doesn't include a copy of Lion. If you don't have a DVD burner, you can use the OS X Lion installer to create a bootable flash drive or a bootable volume on a drive. Now that we have an emergency bootable version of the OS X Lion installer, it's time to turn our attention to the type of OS X Lion installation we want to perform. The Lion installer is designed for an upgrade install over an existing copy of Snow Leopard. Upgrading is by far the easiest process. Once you install Lion, all of the data, applications, and other goodies you had in Snow Leopard are ready to go in your Lion installation. The only real disadvantage to an upgrade install is that you lose your Snow Leopard system. If you have any applications that won't work with Lion, you won't be able to re-boot into Snow Leopard to run them. There is a way around the issue of Lion overwriting Snow Leopard. You can create an additional partition on an internal or external drive, and then clone your Snow Leopard drive to the new partition. This will give you a fallback to Snow Leopard, should you ever need it. Even if you're not concerned about the ability to boot into Snow Leopard, you should make sure you have a current backup before you start installing Lion. You can also create clones using popular third-party applications, such as Carbon Copy Cloner or SuperDuper. The Lion installer wasn't really designed to perform a clean install, that is, allow you to erase your current startup drive and install OS X Lion on the erased drive as part of the installation process. To get around the lack of a built-in method for performing a clean install, you'll need an available partition that you can erase before you start the OS X Lion installer. This is a simple process, provided you have enough disk space, either in the form of multiple drives or a single drive that's big enough to hold an additional empty partition. If you don't have the space to spare, and you had planned to erase your Snow Leopard startup drive, you'll need to create a bootable copy of the OS X Installer, as mentioned above. Once you have a bootable OS X Lion installer, you can boot from the installer, use its copy of Disk Utility to erase your startup drive, and then install OS X Lion. For new versions of OS X, I prefer to use the clean install option because it assures a fresh installation with no accumulated junk from previous versions of the OS. The disadvantage is that you have to migrate your data from your previous version of OS X. This added step takes a bit of extra time, and you can end up moving over the unwanted junk that you were trying to avoid by doing the clean install. However, in my testing of Lion, I haven't found any real problems with using the default upgrade option. I was pleased to see that during the installation process, Lion will corral any application or device driver that Apple knows has issues with Lion. This lessens the chance of bringing over bad juju. That being said, I made sure I had a complete backup of Snow Leopard and all my user data by creating a clone to an external hard drive before I installed Lion as an upgrade. If you don't have an extra drive to use for a backup of Snow Leopard, consider purchasing one. External drives are reasonably priced, and may be even cheaper if you don't mind building your own external drive. You can repurpose the new external drive for Time Machine backups once you're sure that Lion and all your applications and data are compatible. Make sure your version of Snow Leopard is current by using Apple's Software Update service (Apple menu, Software Update). Purchase and download the OS X Lion Installer from the Mac App Store. Back up your current system using an external drive and a cloning process, so that your backup is a bootable copy that you can use in an emergency. Create a bootable DVD or USB flash copy of the OS X Lion Installer. I recommend the DVD version, if you have a DVD burner. Before going any further, make sure the DVD or USB flash drive works as a bootable installer. Choose the installation type you wish to use. Use the appropriate step-by-step guide for the Lion installation type you decide to use. Once Lion is installed, take your time and look through its new features. One good place to start is with System Preferences. During the installation process, you may find that some of your favorite system settings have reverted to the defaults. Looking through System Preferences will also give you an idea of some of the new features of Lion.